Aalayam - Colors, Cuisines and Cultures Inspired! : Dessert table! We've been busy and hence the silence. We were invited to author for The Key Bunch ! Have you been to The Key Bunch yet? They've been around for a while and Sharon and Rekha have done a wonderful job of showcasing beautiful spaces on their blog. While you are at it, check out their house tours too - they have a lengthy line-up of gorgeous homes! I promise, you will not be disappointed. It was a pleasure to write for the readers of The Key Bunch. Thank you for having us over The Key Bunch! 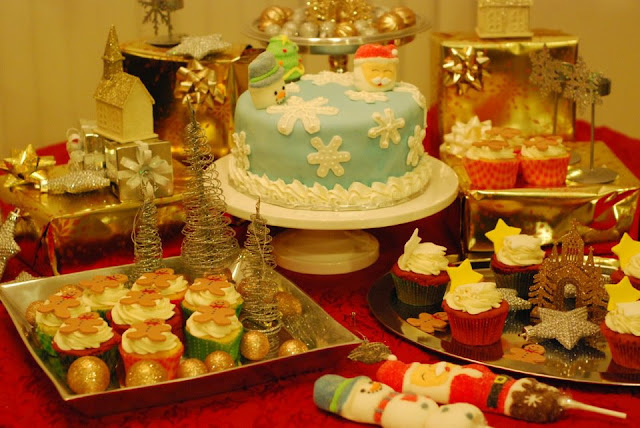 "If you are hosting a holiday party this year, then dress up your dessert table. There’s nothing like celebrating with a perfect cake. So, find a custom cake with a holiday theme. A good looking and a great tasting cake always leaves a lasting impression. Last year, I had a friend make this stunning cake in a pastel blue with white snowflakes and marshmallow holiday toppers. So dreamy! It was a piece of art and I had to showcase it......."
For the rest of this entry, please go over to The Key Bunch. A little inspiration for your holiday party! Hope you like it. And tomorrow - yes! We have a holiday treat for all you wonderful readers. So, come back! its one yummy dessert table.Happy holidays. Thank you again Patricia for taking the time to read our posts. Just trying to share some inspiration, that's all and by no means are we experts at this but thank you again!